When using expanded water jacket plates it is not possible to use the original dipstick design protruding from the cylinder block. It is also rather difficult to extract the dipstick when using the Jackson Design supercharger inlet manifold. We have recently changed our design from using a longer version of the K/L/N/P rocker box knobs to the correct L/early P Type (short) casting. The holder is a copy of the P Type arrangement. 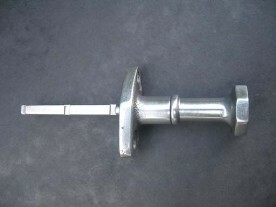 The dipstick stem is calibrated with a milled half way mark. The stem itself is 7/32 inch dia and has a close to airtight fit when in its holder. Supplied fully polished. 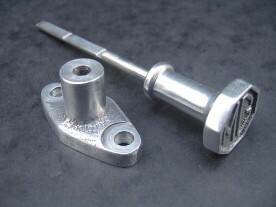 We also manufacture engine oil dipsticks for all other MMM models as well as differential oil dipsticks.